Darren Barnes - Endurance, Adventure & Ultra Marathon Running Blog: Great Men of Courage & Endurance - Robert Falcon Scott's "Message to the Public"
Great Men of Courage & Endurance - Robert Falcon Scott's "Message to the Public"
It is 100 years ago this month that these great men of courage and endurance. Had set out on a journey to be the first explorers to reach the South Pole in Antarctica. There exploration of Antarctica, was aided by means of utilising ponies and dogs as transport. Towards the end of the journey, the men were responsible for man hauling there own sledges. They were beaten by a Norwegian party, that was lead by the explorer Ronald Amundsen. As Scott's men had quickly learnt of there fate, there moral was severely demotivated. During the return journey to "One Ton Depot", a sever blizzard had taken hold. 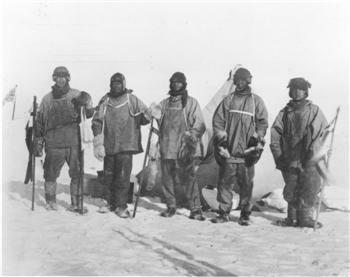 As the men were severely frost bitten, hungry and exhausted. They decided to strike camp just 11 miles short of reaching the safety and warmth of the depot. This is where the men perished, succumbed to the elements of Antarctica. "Had we lived, I should have a tale to tell of the Hardihood, Endurance and Courage of my companions which would have stirred the heart of every Englishman. These rough notes and our dead bodies must tell the tale". Photograph shows - Sitting are Evans & Oates, behind them stands Bowers, Scott & Wilson. I have challenged myself to compete in one of Scotland's most famous 54 mile Ultra Marathons. Where I intend to raise funds for my chosen charity for 2012 - "Pawz for Thought". For further details on the charity's good work and how you could help to support there ongoing efforts, then please click on the above charity's website link. Endurance Run # 5 "The Penshaw Circuit"